A few election cycles ago, a new feature was introduced to televised debates: The real-time reaction tracker. A small focus group of two dozen or so individuals use dials to indicate how much they agree or disagree with the statements being made by politicians during the debate. An aggregated average of these responses is then displayed in real-time for the viewing audience to see. Fascinatingly, this instant reaction poll appears to influence the opinions of the millions of people watching the debate at home. A study published a few years ago in PLoS ONE took advantage of the 2010 parliamentary election in Britain to examine the issue. Students, who were misled to believe that they were attending a study on memory, were assigned to different rooms which were broadcasting the final debate. Unbeknownst to them, the real-time tracker (a.k.a. “the worm”) was being manipulated behind the scenes. 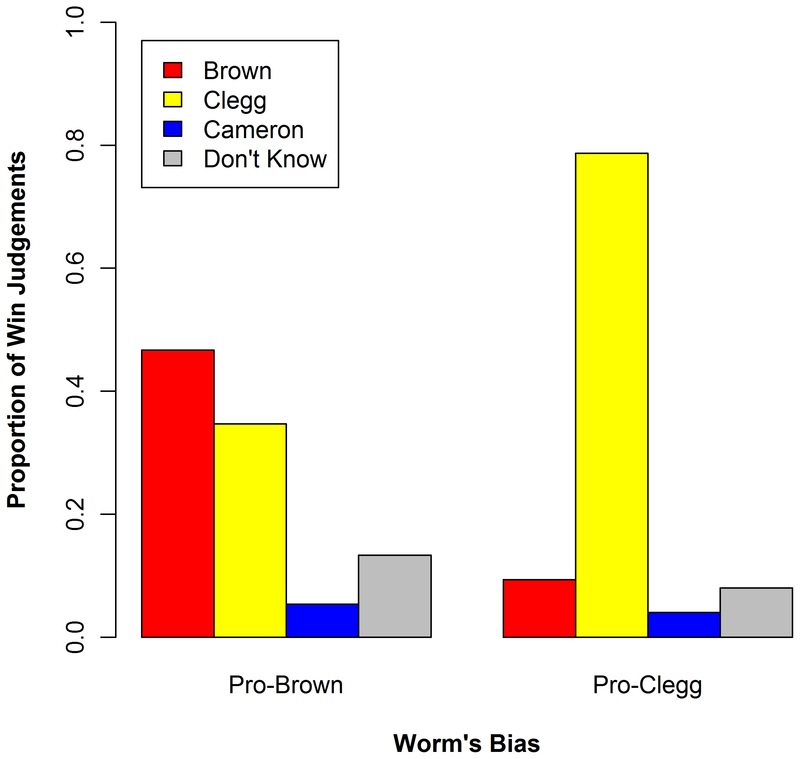 In one room, the worm was biased in favor of Gordon Brown (the incumbent Prime Minister); in the other, it was biased in favor of Nick Clegg (the leader of the Liberal Democrats). Most importantly, students’ voting intentions were also swayed in the direction of the bias of the worm. Oddly, the researchers exposed students neither to a “control worm” nor to a worm biased in favor of David Cameron (leader of the Conservative Party). They did, however, ask random students the following day who they thought won the debate, but this is not a sufficient control. Yet, despite the sloppy experimental design, the results are striking enough to be convincing. Though voters like to think of themselves as independently minded, the reality is that they are rather easily influenced by the opinions of others. Let us hope, therefore, that the media outlets and pollsters who conduct tracking polls aren’t lying to us.